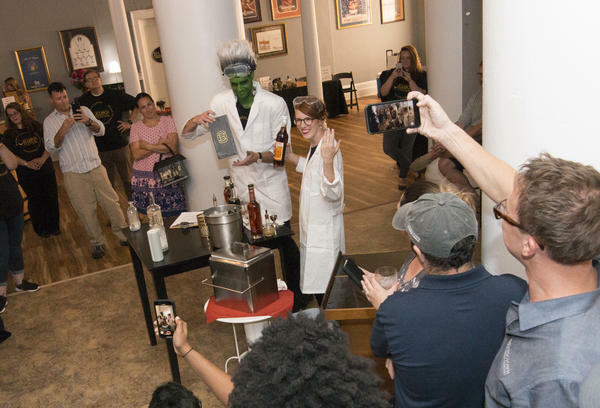 Dan Callaway and Randi Densford handled the mixology work with a mad scientist's flair to wow the crowd Tuesday and win the 2018 Bourbon Capital Mixed Drink Challenge for the Bardstown Bourbon Company's Bottle & Bond bar. Their concoction, "The Modern Prometheus," will be the official cocktail for the 2018 Kentucky Bourbon Festival. 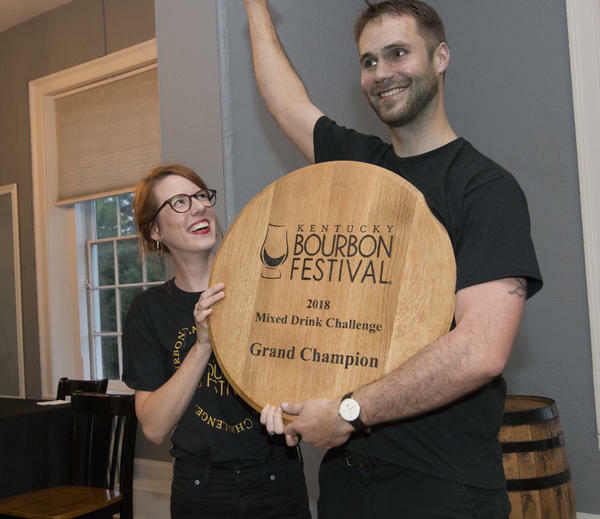 Randi Densford and Dan Callaway celebrate winning the 2018 Bourbon Capital Mixed Drink Challenge Tuesday night at Spalding Hall. 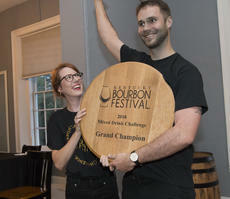 Their entry for the Bardstown Bourbon Company, "The Modern Prometheus" earned the right to be the official cocktail of the 2018 Kentucky Bourbon Festival. 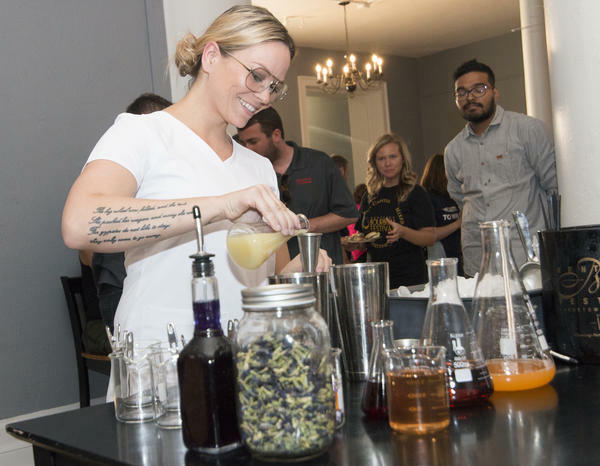 Karla Plott made sure to don her safety glasses before diving into the chemistry of preparing Heaven Hill Distillery's entry for the 2018 Bourbon Capital Mixed Drink Challenge Tuesday at Spalding Hall. 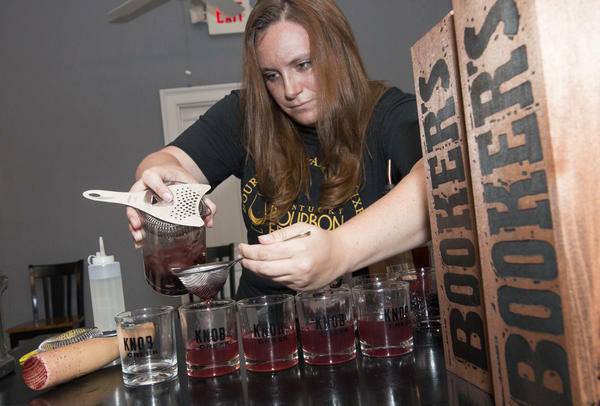 Beth Burrows of Jim Beam Distillery competes in the 2018 Bourbon Capital Mixed Drink Challenge Tuesday at Spalding Hall. Dan Callaway, bar manager of the BBCo’s Bottle & Bond restaurant which opened earlier this summer, and teammate Randi Densford captured the title with their concoction, “The Modern Prometheus,” a cocktail featuring Calumet bourbon, one of the company’s collaborating brands, which will be the official drink for the 2018 Kentucky Bourbon Festival. “The Modern Prometheus” combines 10-year-old Calumet, 20-year-old Pierre Ferrand cognac, walnut and cardamom bitters, fernet amaro syrup, apples, sugar and lemon. He said it was designed to have a good deal of depth and complexity, with the bourbon and bitters countered by the sweetness of the syrup. This year’s KBF poster theme is “Scientific Proof,” designed to highlight the chemistry behind the bourbon-making process, and, by extension, the drink-mixing process. Seven entries competed for the title, with recipes playing off the festival theme. Some of the entrants went even further in their efforts to embrace the theme, but none more so than Callaway and Densford, who entered the room with walk-up music akin to what one might experience at a professional wrestling match. Densford and Callaway, like several others, went for the lab coat and goggles combination in their attire, and Callaway went one step more by painting his face green and inhabiting a Frankenstein’s Monster character, to the delight of the crowd. David Mandell, CEO of Bardstown Bourbon Company, said he loved the show his team put on and it was just one of many examples of the innovative spirit he wants to instill in his employees, while also having fun doing it. Dan Scofield, of distillerytrail.com, was on the judges’ panel Tuesday. 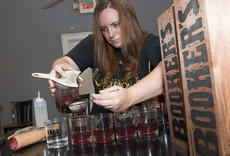 He said it was interesting to see the processes used by the bartenders, as well as sample their creations. This year marked a big change in the calendar for the Challenge, which has traditionally been an April event. Jill Hawkins, the executive director of the Kentucky Bourbon Festival, said the move was made to bring the event closer to the start of September’s festival, serving as an official early opener.